Unless you have spent the past few months living in a cave on an island off Maine (as, indeed, one of my students did some years ago as a winter term project), you will know that we in academia, and particularly those of us who teach at selective liberal arts institutions, are in a challenging moment regarding how we talk about difficult issues in the classroom and in the broader college community. At issue is the question of “civility.” The quotes are not ironic but rather indicate that whether there ever was a consensus on what that meant, it no longer operates. 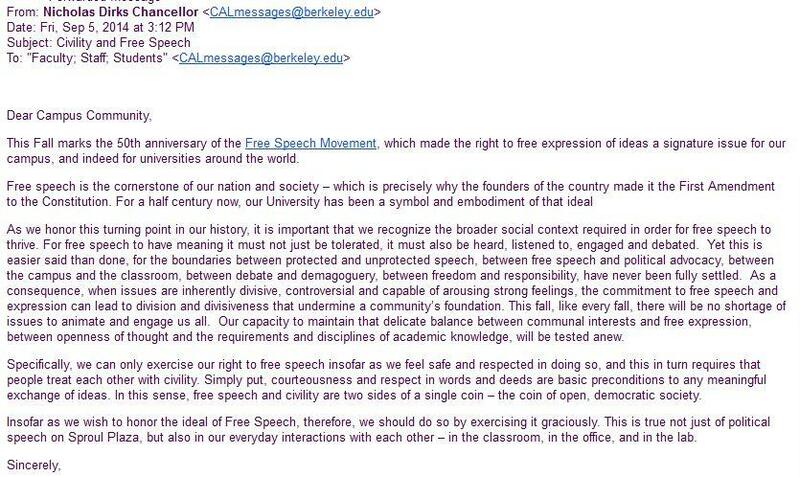 Nicholas Dirks, the Chancellor of the University of California, Berkeley, addressed the topic in an email to students and faculty on the occasion of the 50th anniversary of the free speech movement. And got a lot of pushback. You have probably read Jonathan Chait’s recent article in New York Magazine and followed up with any number of critiques, including those of Gene Demby, Amanda Taub, Alex Pareene, Michelle Goldberg, Lindsay Beyerstein, Jessica Valenti, and well as those who wrote in support. The questions raised by Dirks and Chait as well as their critics are generating a lot of discussion because they are fundamental ones about how we talk, who gets to talk, and what we say to each other when we talk. They are generating discussion because they demand that we think deeply about issues that are hard and messy, questions of power and privilege, the First Amendment, Charlie Hebdo. We live in a world in which these discussions (and their very real effects) are happening on a daily basis; it is a world inhabited by our students as well as ourselves – they don’t just enter the “real world” when they graduate. But the primary arena in which we, as teachers, engage these topics is the classroom. And so this “Article of the Week” is about listening and what it means to create a classroom in which listening is an important part of learning. One of the central challenges we face in the classroom is how we create an environment in which all of our students (and we) can learn: both from us and from each other. Each of us has different comfort levels that determine how, where, and when we incorporate our students not just as learners, but as co-creators of learning in our classes, and I’ll leave discussion of that topic for another time. Similarly, we will all respond differently to the question of how much tension, discord, or “messiness” we can live with in our classes. That will often depend on experience as well as positionality: tenured/untenured, visiting/permanent, male/female/trans, faculty of color/white/biracial, and so on. But we are all interested in constructing our classes in ways that best support significant learning. Some years ago, L. Lee Knefelkamp, now emerita professor of psychology and education at Teachers College, Columbia University, wrote a short article for Liberal Education titled “Listening to Understand” (Spring 2006, pp. 34-35). I went to it again when thinking about how to prepare my classes this semester for the work that lies ahead. Not prepare them in terms of getting the readings selected, thinking about the assignments, or finishing the syllabus. Prepare them for discussing difficult issues that are likely to arise both because of course content and because of the concerns that are on the minds of many students. Preparing them in terms of creating the social contract that would remind them, should discussions get heated, lines crossed, or eyes rolled, about why we are here and how we should interact to promote learning. Rule setting is important preparation, and the only rules for rule setting are that you, the instructor, have to be comfortable with them (you have to understand the degree of discomfort you are willing to work with), your students have to be clear about the rules and take ownership over them, and (at different times for different courses), you will need to revisit them more than once. seek to develop the communication skills that facilitate our learning and our ability to listen, read, reflect, and study to understand. In order to accomplish our goals, we need to develop the capacity of listening for understanding. seeking to expand one’s complexity, personal integration, and skills so that one can respond in appropriate ways to a wide variety of complex situations. We will be working with these concepts as we conduct an assessment of student learning preferences and needs during the first weeks of the course.